The Principal Deputy Chief Monitor calls on the conflicting sides to withdraw from the line of contact. The OSCE Special Monitoring Mission has found that the militants Donbas and the antiterrorist operation troops have been moving their positions closer to the line of contact. 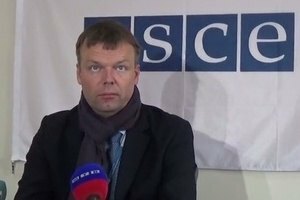 "They are pulling forward, moving their positions, troops and hardware into disputable areas, thus changing the line of delineation in some ways," OSCE SMM Principal Deputy Chief Monitor Alexander Hug said at a briefing on 21 January, according to 112 Ukraine TV. "This is such a myth because there were no "grey zones" ever, there are only zones effectively controlled by one or another side. Certainly, there are certain movements but these movements do not cross the line of contact. What is happening in fact is that they move their positions closer to the line of contact and now they are taking any positions, which used to be vacant, for any tactical reason." He said that the line of contact had not changed. "However we can see certain movements near Pavlopil and Kominternove. As a result, the security zone got narrower, which means that the armed groups which do not trust each other are now closer to each other, standing one in front the other quite close, while tension is growing and certain kinetic activities are happening there," Hug said. He called on both sides to pull back.